Both antiseptic and antibiotic are antimicrobials, chemical substances that destroys germs or micro-organisms (bacteria, fungi, and other pathogens). An anti-bacterial is an antibiotic, but as the name signifies, it can only target bacterial germs. Antibiotics, can totally destroy and kill microbes and pathogens and prevent them from growing. Antiseptics inhibit the development and reproduction of germs (micro-organisms) that cause diseases in living tissues. They are different from antibiotics and antiviral substances, that function inside the body, and from disinfectants, that are anti-microbial agents applied to the surface of the non-living objects. Antiseptics can effectively target a combination of bacteria, viral species, fungal species or other microscopic organisms. The invention and development of antiseptic substances and principles started in the nineteenth century and are at present universally employed in first world countries. While antiseptics are known to destroy infection carrying agents, they can also be efficient as bacteriostatic substances that prevent or greatly restrict bacterial growth. 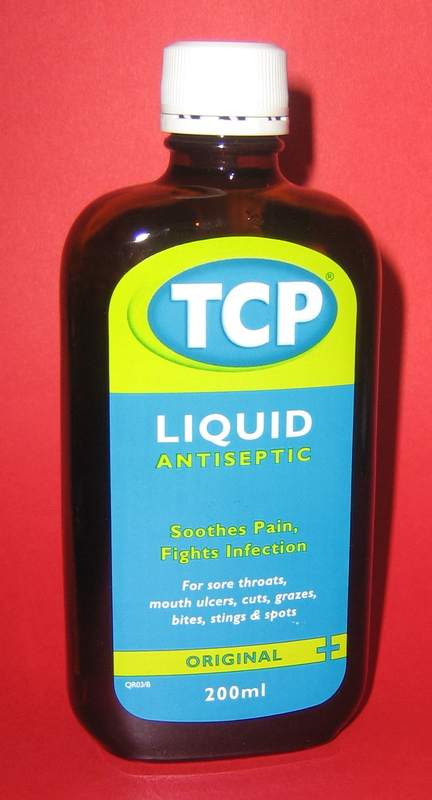 By obstructing or averting further pathogenic growth, such antiseptics can put a time cap on an infection. Antibiotics are chemicals which one microorganism produces to kill or inhibit another bacterium carrying microorganism. Antibiotics are utilized to treat bacterial infections. Some antibiotics are super specialised and are target only specific bacterial species. Some others antibiotics, known as broad-spectrum antibiotics, target a wider range of bacteria, including the ones that are advantageous to us. There are 2 major methods in which an antibiotic kills bacterium. They either inhibit the multiplication of bacteria, or they destroy the bacteria, for e.g.by impeding the mechanism responsible for developing their cell membranes. 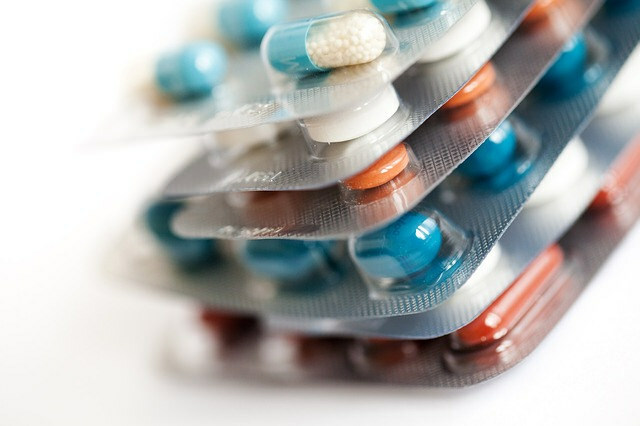 Antibiotics at various occasions are used in a limited number of patients before surgical procedures to ensure that patients do not get any infections from pathogens entering open wounds. Without this precautionary measure, the danger of blood poisoning would become higher, and many of the more complicated surgeries, doctors now do will not be possible. A chemical substance that can destroy diseases which carry microorganism by local application on skin, cavities or mucosa is known as antiseptic. Antiseptics were first invented by Ignaz Semmelweis in 1847. Antibiotic term is a combination of two Greek words which mean “against life”. Antibiotics are basically chemical substances that are generated by group of some microscopic organisms and possess the ability to deactivate or destroy/kill other harmful microorganisms, usually infection causing bacteria. Even when in lower concentration, antibiotics are quite reactive. The first ever antibiotic discovered in 1929 by Alexander Fleming was penicillin. It was discovered from a mould culture. Now a day, it is a powerful antibiotic that is being widely used worldwide and is generated by microbial strain chrysogenum and its mutant. Antiseptics can be applied anywhere topically and hence have multiple areas of activity. They have a non-specific action. Antibiotics target a specific area or site of the affected organisms. For e.g. penicillin acts against the cell membrane of the organisms, while tetracyclines show their action on the ribosomal subunit. Antibiotics thus can target only specific area. All antiseptics influence with critical life activities of microscopic organisms. Benzylalkonium, for e.g., impacts by its interference on signalling within the cell and chemistry to the point that the cell envelope starts to flake into pieces. Iodine admixtures irreversibly distort, or transform, critical proteins in bacteria, starting at the cell membrane and showing movement in the inside direction. Alcohol also adulterates and destructs cellular envelopes. Some soapy cleaners and detergents lead to cell coverings of bacterium to mislay purity or alter critical proteins. Some other antiseptics are supposed to directly interfere with critical enzymes inside a bacterium. Antibiotic function generally falls within one of four mechanisms, three of which involve the restriction or managing of enzymes irresponsible for cell membrane biosynthesis, nucleic acid chemical processes and restoration, or protein amalgamation, respectively. The fourth mechanism incorporates the rattling of cellular covering layer. Most of these activities of cell, encountered by antibiotics are usually active in cells that show multiplication and division. Since there is often overlapping in these actions between unicellular bacterial cells and mammalian cells (containing nucleus), it is not unexpected that some antibiotics have also been found to be useful as anti-cancerous. Tincture of iodine, Sodium ethylmercurithiosalicylate, Thimerosal, Mild Silver protein, Merbromine, Triiodomethane (Idoform), Chlorhexidine (CHX), Chloramine (Chloramine-T), Octenidine dihydrochloride, Chlorhexidine Gluconate, Benzethonium chloride. Daptomycin, Fluoroquinolones, Nitrofuration, Sulfonamides , Co-trimoxazole, Monobactams, Vancomycin, Telithromycin, Penicillin derivatives (penams), Cephalosporins (cephems), Carbapenems, Tetracydines, Metronidazole, Spectinomycin, Chloramphenicol, Lincosamides, Macrolides, Trimethoprim. Lemon, honey, pineapple, eucalyptus, Tea tree oil, Lavender, Activated Charcoal, Yarrow, Calendula, Comfrey, Plantain, Aloe. Olive leaf extract, Garlic, Green tea, Myrrh, Colloidal silver, Goldenseal, Echinacea, Oregano oil, Manuka Honey, Oregano Oil, Garlic (extract), Cinnamon, Fermented Foods, Ginger, Pau d’ Arco, cod liver oil, Cayenne Pepper, Grapefruit Seed Extract (GSE), Turmeric. Dr. Amita Fotedar -Dr. "Difference Between Antiseptic and Antibiotic." DifferenceBetween.net. 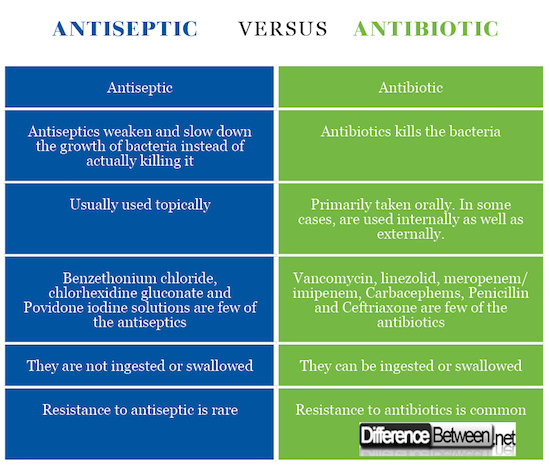 April 2, 2018 < http://www.differencebetween.net/science/difference-between-antiseptic-and-antibiotic/ >. McDonnell, G., & Russell, A. D. (1999). Antiseptics and disinfectants: activity, action, and resistance. Clinical microbiology reviews, 12(1), 147-179. Norman, G., Dumville, J. C., Mohapatra, D. P., & Crosbie, E. J. (2015). Antibiotics and antiseptics for surgical wounds healing by secondary intention. status and date: New, published in, (6). Reiner, R. (1982). Antibiotics: An introduction. F. HOFFMAN-LA ROCHE & CO., LTD., BASLE(SWITZERLAND). 1982.